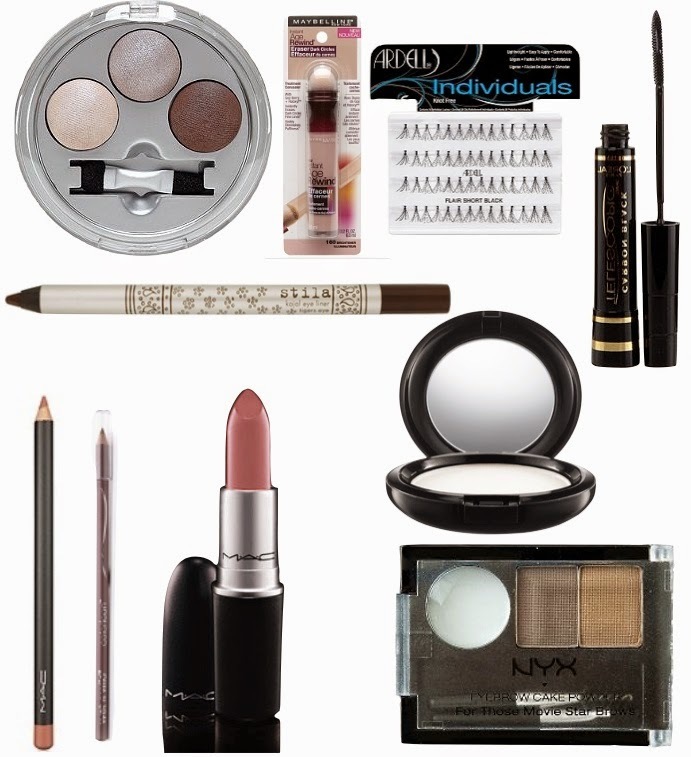 Fall makeup is ready to help you change your look. When I was brainstorming and thinking of Fall makeup, I was looking at photos on and off the runways and I kept thinking back to the grunge era of the 90's with Teen Spirit and Nirvana running through my head. Darker pouts, smoked out eyes with smudged liner, sporadic but fuller lashes (not strips) and brighter foundation that is definitely matte with a super defined brow. Phew! Thats a lot compared to Summer makeup and I am so excited to share all of these items above. Eyes// smoke them out, start with the liner and smudge it with a brush or Qtip, then run a bit of dark shadow directly over the liner, the mid tone blended right above that into the lower portion of your crease and the lighter color to highlight. Remember to smudge a little of the two darker shadows under your eye as well and I love lining my water lines on both top and bottom. Brows// fill em in ladies. Bigger, bolder brows are it! NYX makes a fab product for brows that come in different shades according to your hair color. Face// Remember to lighten up your foundation as the season changes and your tan fades. I am loving the Maybelline Brightener to enhance my under eye area followed with MACs translucent powder to achieve that more matte look without appearing caked on! Lashes// sporadic falsies are in. You can still wear an entire strip but try a couple individuals on the outer edge, one in the middle and one a little more spaced to wards the inner corner. If lashes aren't your bag then try my new fave mascara by Loreal. It looks very similar to falsies and is a whole lot easier to use. Lips// OK this is my favorite! We have all see the super gorg Kylie Jenner on IG and all her lippy photos right?! One of her famous combos is MACs Whirl liner and Faux Lipstick. However Whirl is sold out everywhere so I went to CVS and bought a high school fave from Wet 'n Wild #666 and I swear it is SO similar for $2. Lol Remember that with darker lips you'll need to exfoliate (I love sugar) and hydrate (coconut oil) at night so your lips look flawless for daytime. Put a little foundation on your lips and then line your entire lip area and fill them in. This will keep your lipstick from bleeding and help it last longer. Fall makeup is so fun to change up! I constantly use the same under eye circle brightener as you. I also like how you found a MAC dupe! I love neutral eyes for fall.